Cold Steel is a set of rules designed and developed by the Napoleonic group at NWA, particularly Andrew and Tim Bayly. 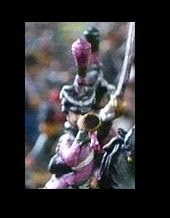 25mm metal figures are mainly used at the club, although one member uses well painted 20mm plastics. The Napoleonic group is active at both the Mitcham and the Croydon venues. John R. reckons he can write my After Action Reports himself; "If only I'd done...", "I should have done...", "I didn't spot..." etc. etc. Funny b*stard! In preparation for the upcoming Wagram re-fight, we played a 1:120 scale battle French versus Austrians. Tim and Andrew S. playing the horrible Hapsburgs, while Tony and I commanded the Emperor's finest. I hadn't really got my head around what 1:120 meant, assuming that for the same number of points, I'd have half the number of troops I'd usually have on the table-top, so Tony and I started out drastically outnumbered! Part 1 of the Battle of Ligny. The Battle of Ligny and the battle of Quatre Bras both occurred on the 16th June 1815. These were the first battles after the return of Napoleon from his exile on Corsica. The NWA Napoleonic group put on another of their New Year big battles also recreating both battles at the same time. This is part 1 of the battle of Ligny between Blucher's Prussian army and Napoleon's French army, as the armies deploy and the initial orders are given. Part 2 of the Battle of Ligny. The Battle of Ligny and the battle of Quatre Bras both occurred on 16th June 1815. These were the first battles after the return of Napoleon from his exile on Corsica. The NWA Napoleonic group put on another of their New Year big battles also recreating both battles at the same time. This is the second part of the battle of Ligny between Blucher's Prussian army and Napoleon's French army, as the French open the battle. Part 3 of the Battle of Ligny. The Battle of Ligny and the battle of Quatre Bras both occurred on the 16th June 1815. These were the first battles after the return of Napoleon from his exile on Corsica. The NWA Napoleonic group put on another of their New Year big battles also recreating both battles at the same time. This is part 4 of the battle of Ligny between Blucher's Prussian army and Napoleon's French army. Part 4 of the Battle of Ligny. The Battle of Ligny and the battle of Quatre Bras both occurred on the 16th June 1815. These were the first battles after the return of Napoleon from his exile on Corsica. The NWA Napoleonic group put on another of their New Year big battles also recreating both battles at the same time. This is part 4 of the battle of Ligny between Blucher's Prussian army and Napoleon's French army, as both armies make counter-attacks. Part 1 of the Battle of Quatre Bras. The Battle of Ligny and the battle of Quatre Bras occurred simultaneously in June 1815. The NWA Napoleonic group put on another of their New Year big battles also recreating both battles at the same time. Read this report about the battle between Marshal Ney and the Duke of Wellington. Part 2 of the battle of Quatre Bras. As the figt continues, Gémioncourt farm is captured, but Jérome's attack stalls. Allied reinforcements continue to march onto the battlefield. The NWA Napoleonic group put on another of their New Year big battles recreating th ebattle of Ligny and the battle of Quatre Bras at the same time, as occurred historically. Read this report about the Quatre Bras battlefield. Part 3 of the battle of Quatre Bras. The Guard Light Cavalry arrives on the battlefield, bringing fresh hopes to the French side of Marshal Ney. See whether they were able to alter the historical outcome. The NWA Napoleonic group put on another of their New Year big battles recreating the battle of Ligny and the battle of Quatre Bras at the same time. Read this report about the conclusion of the Quatre Bras battle.